Banksy Is Believed To Be Behind Eavesdropping Mural Near British Spy HQ : The Two-Way A telephone box near British spy agency GCHQ is now adorned with a trio of snoops, after a mural was added to a wall this weekend. The art is believed to be the work of street artist Banksy. 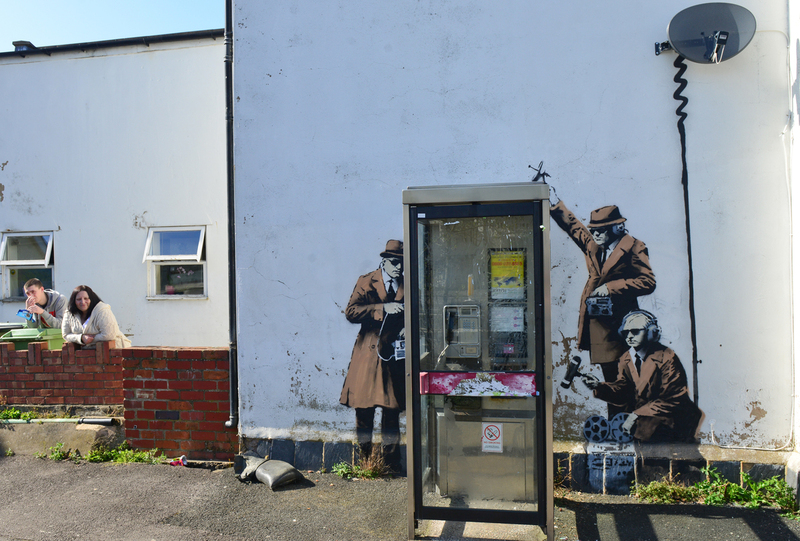 Suspected Banksy artwork appears on the side of a house, depicting government agents spying on a phone box near GCHQ (Government Communications Headquarters) in Gloucestershire, England, Sunday. A telephone box near Britain's Government Communications Headquarters is now bracketed with a trio of snoops, after a mural was added to a nearby wall this weekend. The art is believed to be the work of Banksy, who often uses public spaces as his canvas. The mural was painted around the telephone box to create the image of three trenchcoat-clad men wearing sunglasses, holding microphones and other surveillance gear. A dark streak of paint rises above them, linking their scene with a satellite dish that's anchored on the side of the house. The art was created about 3 miles from the massive offices of British intelligence agency GCHQ, according to the BBC. It's on the side of a house where Karen Smith lives, across the street from a pub. "I heard people talking all night and couldn't sleep, but I didn't look out, as you get used to people out there all the time," she tells the Gloucestershire Echo. "At one point there was a young girl and two lads out there." Smith says she spotted men putting a white tarp into a van near the phone booth early Sunday morning. Of the art, Smith said, "It's pretty good. It livens the street up a bit. There have been a lot of people about today looking at it." The BBC spoke to artists and experts who say they believe the work is indeed by Banksy. "It's certainly in his style and has the supporting cast of characters that you'd expect from one of his pieces," gallery owner Vince John said. "It's taking a swipe at GCHQ and commenting on the establishment, which is something that he does very well." Local street artists and the Cheltenham Borough Council are taking steps to protect the art from vandals and thieves, the Echo reports.